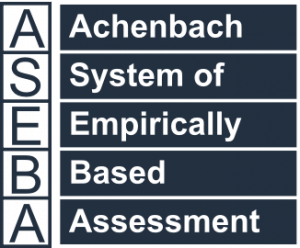 Software is available for scoring all 21st century ASEBA forms. The scoring software includes multi-cultural norms for ages 1½-5, 6-18, and 18-59. Scales include empirically-based syndromes, DSM-oriented scales, Internalizing, Externalizing, Total Problems, Stress Problems, Obsessive-Compulsive Problems, Sluggish Cognitive Tempo, and Critical Items identified by clinicians as being of particular concern. The software displays scale scores on profiles in relation to age, gender, informant, and society-specific norms. The software also compares item and scale scores obtained from multiple informants’ ratings of the person being assessed. Several ASEBA forms additionally assess competencies, personal strengths, and adaptive functioning. To help users coordinate empirically based assessment with the diagnostic categories of the American Psychiatric Association’s Diagnostic and Statistical Manual (the DSM), problem items are scored on DSM-oriented scales updated for DSM-5, as well as on empirically based scales. The DSM-oriented scales were constructed by having experts from many societies identify ASEBA problem items that they judged to be very consistent with particular DSM diagnostic categories. Like the empirically based scales, the DSM-oriented scales are scored by summing the ratings of the constituent items, are normed, and are displayed on profiles and in cross-informant comparisons. The DSM Guide for the ASEBA documents construction of the DSM-oriented scales and illustrates clinical and research applications. The 21st century editions of the Child Behavior Checklist for Ages 1½-5 (CBCL/1½-5) and the Caregiver-Teacher Report Form (C-TRF) were first published by the Research Center for Children, Youth, and Families (RCCYF) in 2000. Their development and applications are extensively documented in the Manual for the ASEBA Preschool Forms & Profiles. In 2010, the RCCYF released multicultural norms for the CBCL/1½-5 and C-TRF. The scoring software enables users to display problem scales scored from both forms in relation to norms for children from user-selected societies. The Multicultural Supplement to the Manual for the ASEBA Preschool Forms & Profiles details construction and applications of the multicultural norms. The CBCL/1½-5 includes the Language Development Survey (LDS), which was developed by Dr. Leslie Rescorla, Professor of Psychology and Director of the Child Study Institute at Bryn Mawr College. Based on parents’ reports of their children’s vocabularies and word combinations, the LDS screens for language delays, based on norms for ages 18-35 months. The LDS can also be used to evaluate the language levels of older children whose language is delayed and to evaluate changes in children’s language development from one occasion to another. The 21st-century editions of the Child Behavior Checklist for Ages 6-18 (CBCL/6-18), Teacher’s Report Form (TRF), and Youth Self-Report (YSR) were first published in 2001. Their development and applications are extensively documented in the Manual for the ASEBA School-Age Forms & Profiles. Multicultural norms for the CBCL/6-18, TRF, and YSR were released in 2007, as detailed in the Multicultural Supplement to the Manual for the ASEBA School-Age Forms & Profiles. In 2001, the RCCYF published the 21st century edition of the Semistructured Clinical Interview for Children and Adolescents for Ages 6-18 (SCICA), which is administered by clinical interviewers. In 2004, the RCCYF published the Test Observation Form for Ages 2-18 (TOF), which enables examiners to assess behavioral and emotional problems observed while they administer individual ability and achievement tests. And in 2009, the RCCYF published the 21st-century version of the Direct Observation Form (DOF), which obtains ratings of behavior observed in group settings such as classrooms and recess. The SCICA, TOF, and DOF Manuals detail the development and applications of each instrument. The Brief Problem Monitor (BPM) was first published in 2011. It has versions completed in 1-2 minutes by parents (BPM-P), teachers (BPM-T), and youths (BPM-Y) to assess changes in problems over brief user-selected periods (several days to several months). First published in 2003, the Adult Self-Report (ASR) and the parallel Adult Behavior Checklist (ABCL) for completion by adult collaterals assess diverse problems, personal strengths, adaptive functioning, and substance use. Their development and applications are documented in the Manual for the ASEBA Adult Forms & Profiles. In early 2015, we added multicultural norms and published the Multicultural Supplement to the ASEBA Adult Forms & Profiles. The Older Adult Self-Report (OASR) and the parallel Older Adult Behavior Checklist (OABCL) were first published in 2004. The Manual for the ASEBA Older Adult Forms & Profiles and the Guide for ASEBA Instruments for Adults/18-59 and Older Adults/60-90+ document development and applications of these instruments. ASEBA-Web provides online entry and scoring of ASEBA forms. ASEBA-Web additionally enables users to print forms for paper-and-pencil completion, plus key entry of data from forms.